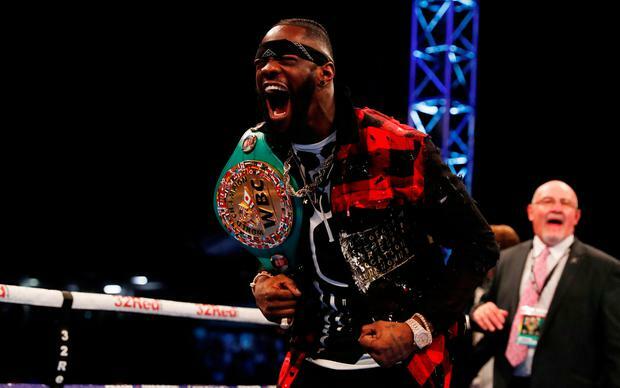 World heavyweight champion Deontay Wilder has reportedly been pelted with chicken by middleweight champion Billy Joe Saunders in a bizarre showdown at a Belfast Nandos. WBO world middleweight champion Billy Joe Saunders is a friend of Tyson Fury, who takes on Francesco Pianeta as the main undercard on Saturday's Windsor Park bill, while Deontay Wilder is widely expected to be Fury's next opponent should he come out on top in his bout. Both fighters are in town for Saturday night's major outdoor boxing bill, headlined by Carl Frampton in his fight against Australian Luke Jackson. The incident, which was captured on video by a number of other diners in the restaurant, took place at the Dublin Road branch of Nando's on Friday shortly before 10pm. Billy Joe Saunders is initially seen approaching Wilder's table and greeting the heavyweight, shaking his hand. They then share a brief conversation before the encounter turns ugly and a number of people stand up around the table, with the camera footage cutting away. A number of social media users who were in the restaurant say Saunders threw the chicken at Wilder as he made his escape. A separate video shows Saunders scrambling towards the exit of the chicken restaurant, followed closely behind by members of Wilder's entourage. A third video taken from a different angle shows Saunders and a man in a red tracksuit - a member of Wilder's entourage - scrambling through the restaurant between diners, knocking over tables. The footage is grainy, but Saunders is identifiable by a distinctive print t-shirt which he was seen wearing on social media earlier in the day. It was initially reported the man in the red tracksuit chasing Saunders was Wilder, although it is now believed he is a member of his entourage spotted with him earlier in the day. Earlier on Friday Wilder appeared at Tyson Fury's weigh-in at the Europa Hotel, taking part in a light-hearted showdown Fury's father John. Both Saunders and Wilder are expected to be ringside at Windsor Park on Saturday night.